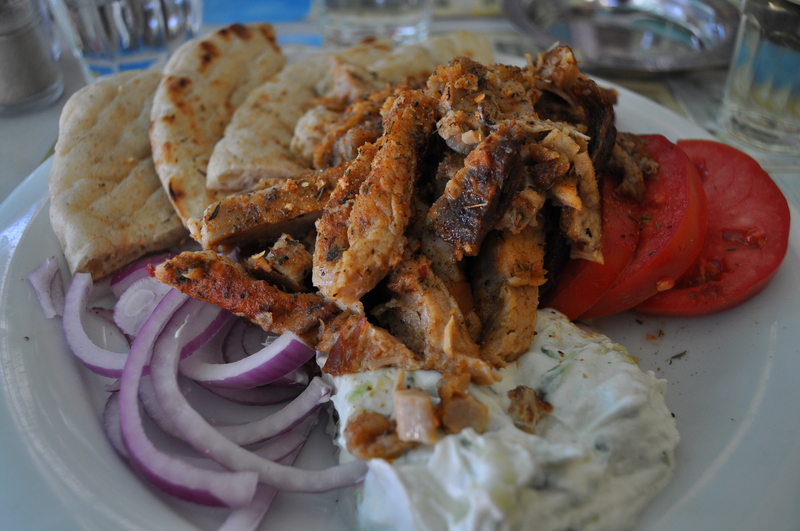 To me, the Greek cuisine is very underrated. While most people (in the UK at least) are familiar with the staples of Mousakka, Tzatziki, Feta and Halloumi the broader spectrum of Greek cooking doesn’t seem so widely known and it can be pretty hard to track down a good Greek restaurant in many cities. 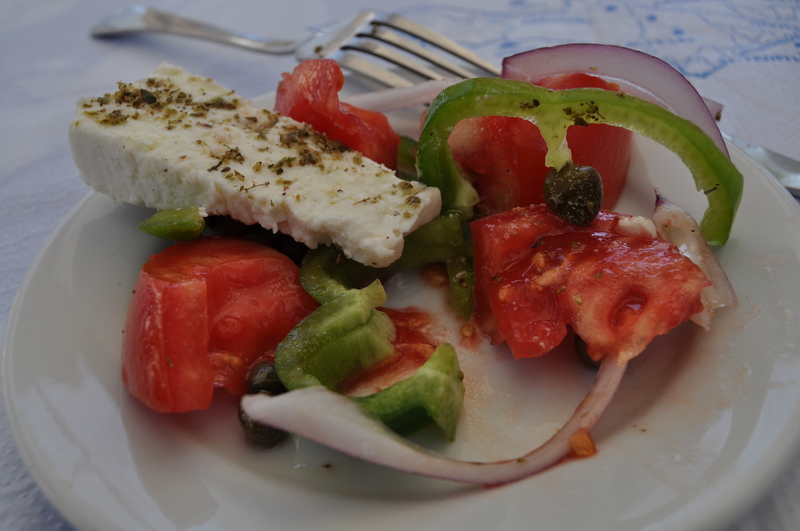 I have visited a few Greek islands as part of holidays and always enjoyed trying all the different dishes on offer. However it’s been quite a few years now since I was over there and while it’s fun to recreate things at home, it’s always great to enjoy the real deal. As a result I was really excited that, in addition to all the food I on the boat, I would also be able to sample some authentic Greek cooking while on the Islands and in Athens. My first Greek stop was the island of Santorini where I embarked a short boat trip round to Oia in order to take in the amazing view of the caldera. 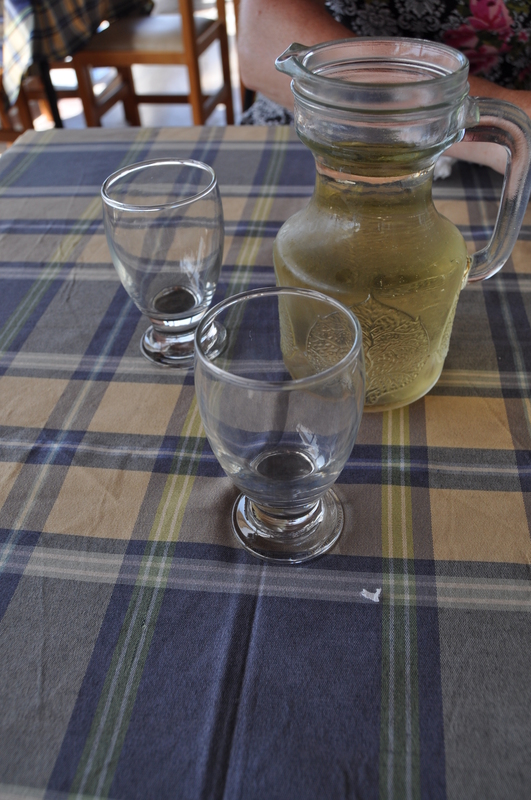 Sanotrini is famous for its wine and I was keen to try some so after a while walking round in the (scorching) heat and taking pictures we popped into a little taverna for some refreshment. Rather than opting for an expensive bottle we went for a carafe of the unnamed local white which was delicious and at €4 for 500mls an absolute bargain! Refreshed, we then caught a bus round to Fira, the town above where the ship was moored. After a bit of a look round we popped into another taverna for snacks before heading back on board. Here we shared a Greek salad and some of the pies of the day, which turned out to be feta. 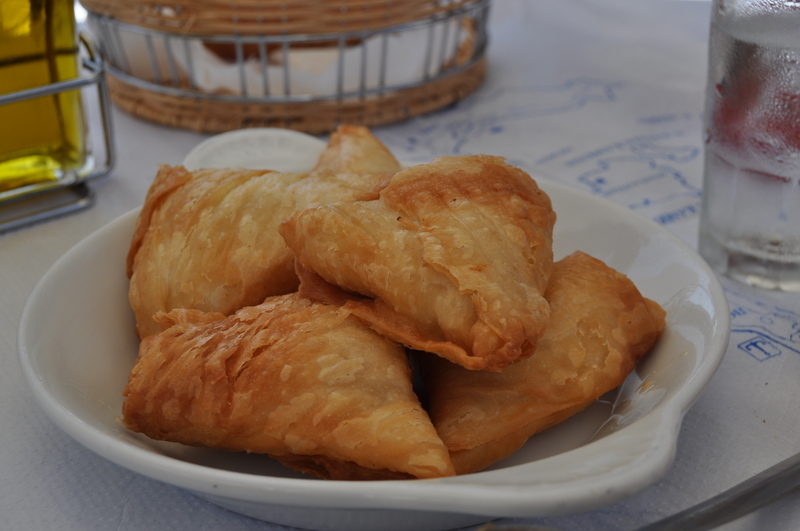 The portions for each were huge: five crisp and flaky individual pasties which were divine and a very generous portion of fresh salad topped with an enormous slab of feta. Our next Greek destination was Mykonos where unfortunately I had already eaten before leaving the ship and so wasn’t able to try any of the amazing fresh fish and seafood that was on offer. 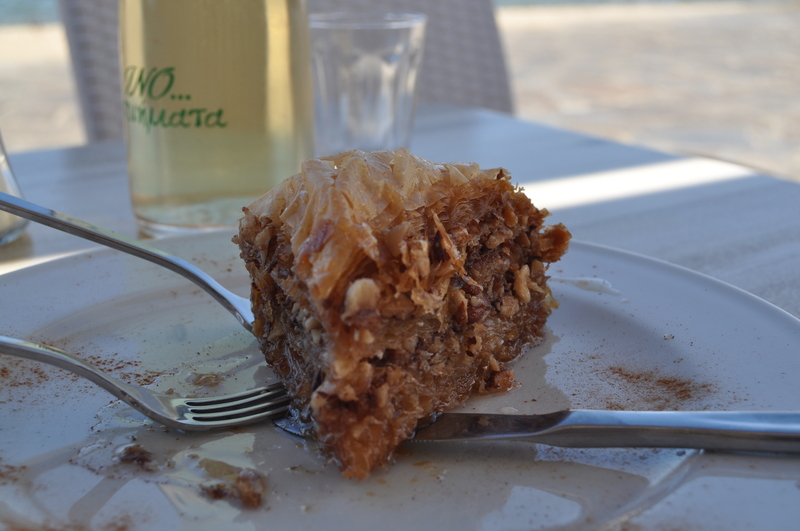 It wasn’t all bad news on the food front though as after some exploring to build up an appetite I was able to sample some delicious homemade baklava down on the waterfront. Many times when I’ve had baklava both and home and abroad it’s has been made and served as bite size pieces but there was nothing dainty about the baklava at this restaurant. We were given a colossal slab of filo, nuts and honey all of which tasted divine. 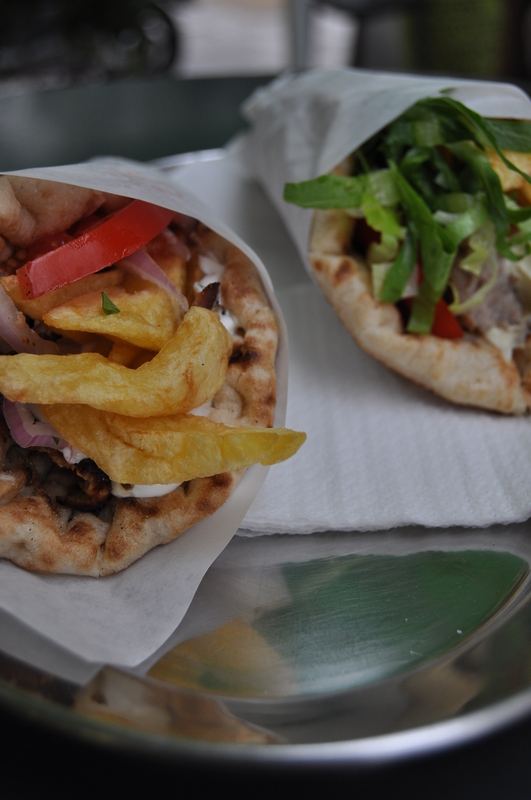 The final Greek destination was Athens where we stayed for one night and where I managed to indulge my craving for gyros. Gyros is basically a traditional kebab, but bears no resemblance, either visually or in flavour, to the processed “meat” you get in most UK kebab shops. Instead thin layers of spiced pork are built up on a skewer and interspersed with layers of fat and then rotated and cooked slowly resulting in the amazingly tender and moist pieces of meat which I can’t resist. It’s usually served one of two ways: either on a plate with the accompaniments (fresh tomato, sliced red onion and garlicky tzatziki) and pitta on the side or as a quick takeaway snack with the meat et all in wrapped in the pitta bread. Being greedy over the course of our stay I tried both as well as a slight variation of take away version with the gyros meat replaced with chicken souvlakia (an individual skewer of meat marinated in lemon garlic and oregano)! All were wonderful and I wish I had time (and the stomach space) to have eaten even more. 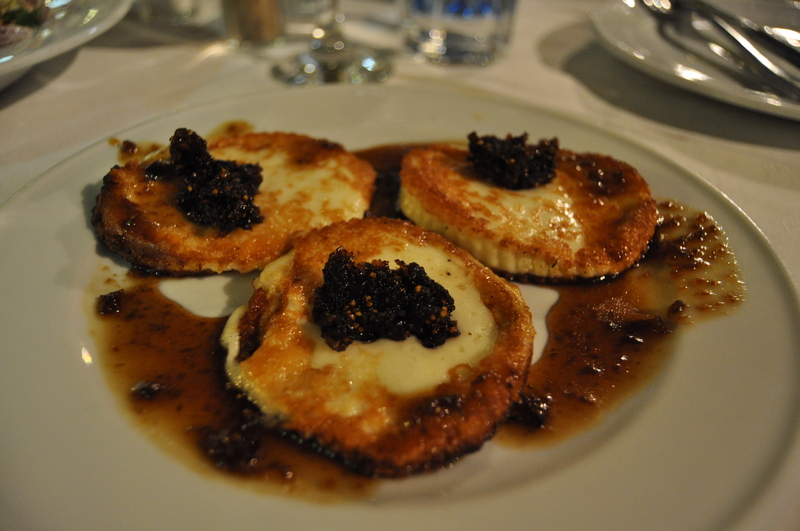 For our one evening meal in Athens I reluctantly held back from consuming yet more gyro in order to sample some other dishes – fried cheese with figs and giouvetsi. The fired cheese with figs was exactly as it sounds, rounds of crisp fried cheese topped with confit figs and a fig and honey dressing/sauce, a ridiculous rich and indulgent starter. 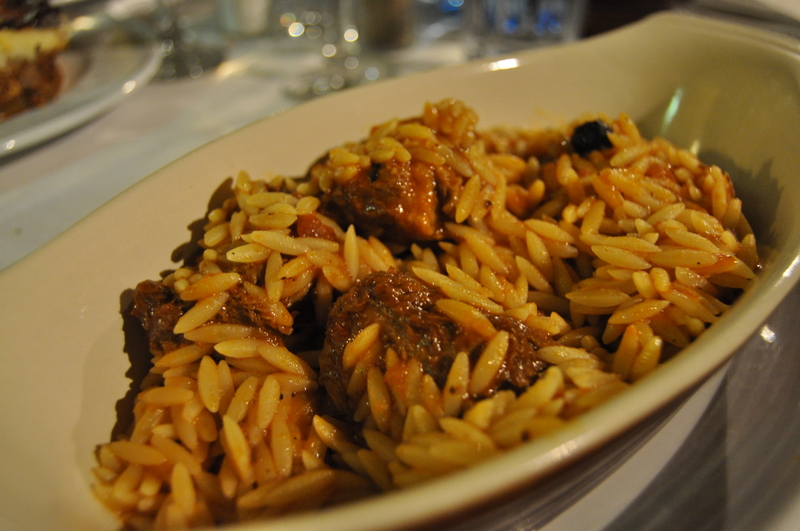 Giouvetsi is a classic Greek dish of soft slow cooked beef or lamb chunks (mine was actually veal) baked with orzo pasta in a cinnamon spiced tomato sauce. Overall I can’t praise the Greek food and wine I consumed highly enough. I didn’t have a single bad/meal or dish and I can’t wait till I can go back sometime and eat more. In the meantime I’m going to have to see if I can find a good Greek restaurant in Geneva and I’ve brought back some authentic dessert filo to have a go at making my own baklava! A couple of weeks ago I finally embarked on my much needed and eagerly anticipated holiday – A week’s cruise stopping in Italy, Greece and Turkey and bookended by stays in Rome and Athens. I was hoping, among other things, to get experience some great regional food and to luxuriate in not having to cook for a few days. Unfortunately things did not get off to a good start as my first meal in Rome (some very tasty spaghetti carbonara followed by roast veal) ended up giving me food poisoning! As a result I didn’t eat much for the rest of my Rome stay apart from Gelato! Luckily I was feeling much better by the time we made it to the ship and ready to explore all the different food options. I was travelling on the Ruby Princess, whose dining venues included hot dog, burger, pizza and ice cream stands by the pools, a couple of buffet style casual dining venues, a café, three formal dining rooms (all serving the same food) and two specialty restaurants (one of which I never actually stumbled across) so there was plenty to choose from. 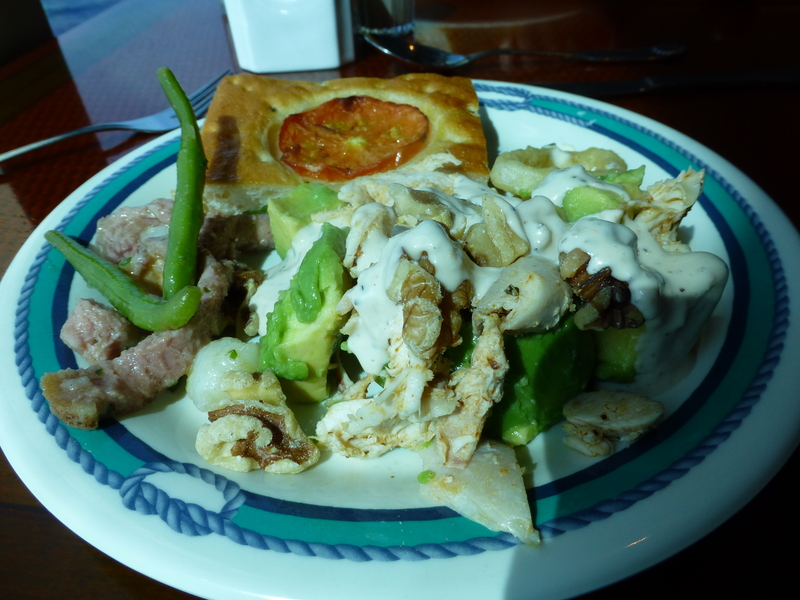 Mass catered food is always a bit hit and miss and this proved to be the case with the food on the ship. 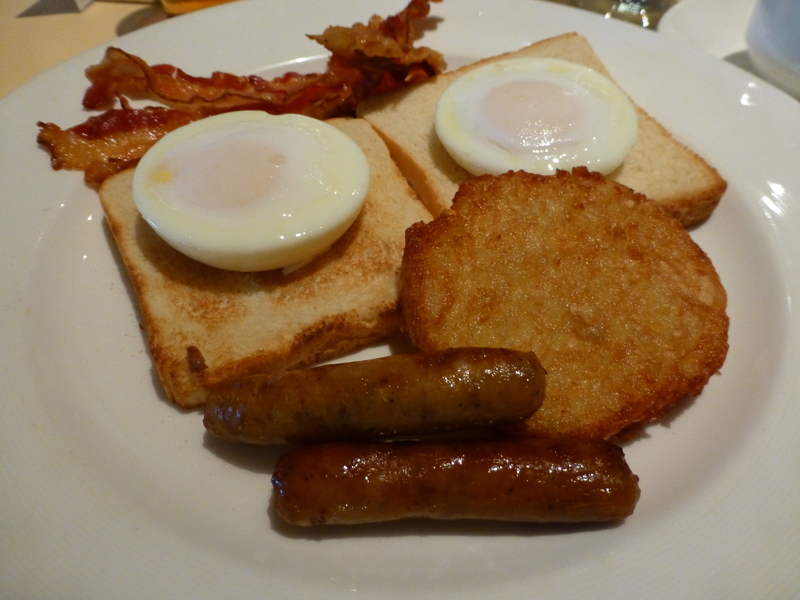 Breakfast was a mixed bag with a superbly tasty and meaty range of sausages and fresh English muffins countered by the wateriest beans I’ve ever encountered and horrifically overcooked eggs in the buffet section. You could get freshly poached eggs in the formal breakfast section but no sauce or beans and due to time constraints, service was very “relaxed”, I only visited this once. Lunch was always a large and varied affair with a huge range of different choices available at the buffet, the pizza and burger stations and the café. As with breakfast, the buffet had highs and lows. 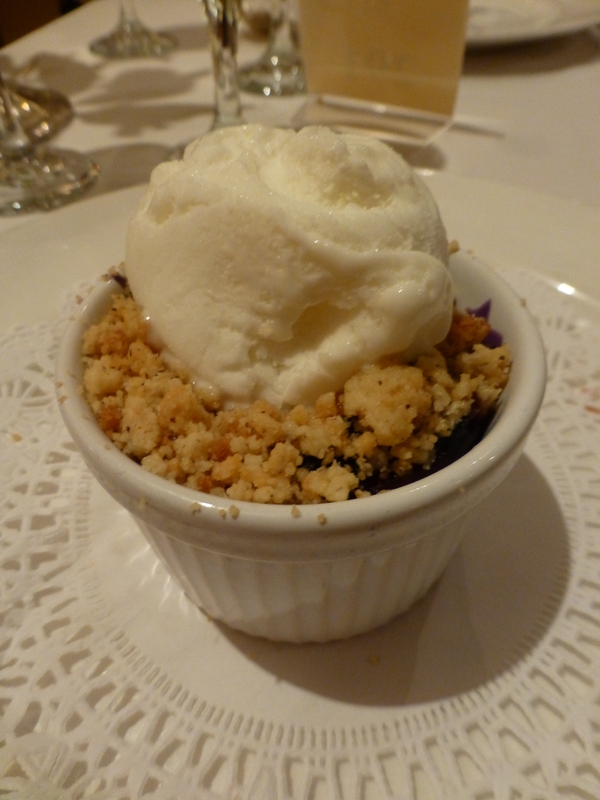 Some dishes were delicious and some were disappointing, but the extensive choice meant that you could always find something that suited your tastes. The pizza section provided perfectly crisp slices which made a great lunch option or afternoon snack. For our evening meal option we had gone for “Anytime Dining” meaning we could go at any point between 6pm and 10pm rather than being tied to the same time each night. This flexibility worked really well and despite its popularity we never had to wait more than 10 minutes for a table whenever we did turn up. 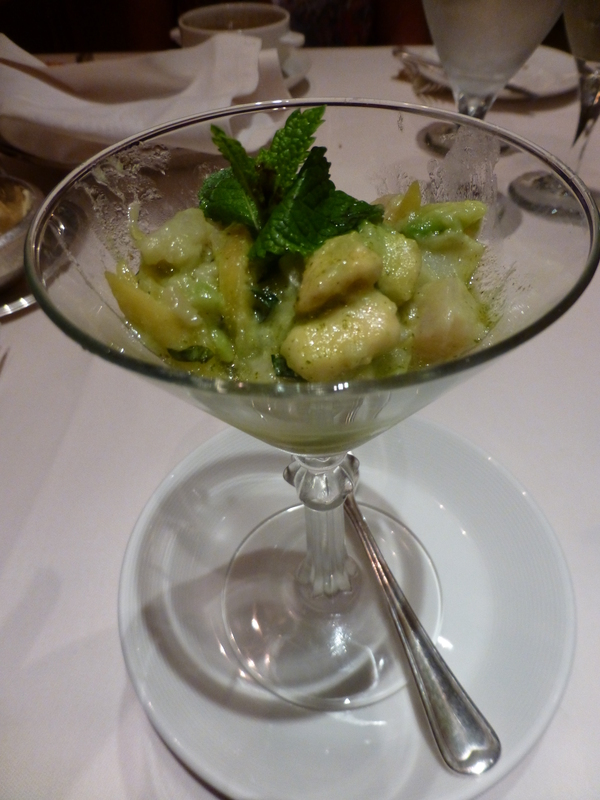 In the evenings the starters and desserts were consistently great, I didn’t have a bad option on the entire cruise. Particular highlights were a fragrant and light crab cake and a wonderfully fresh ceviche. 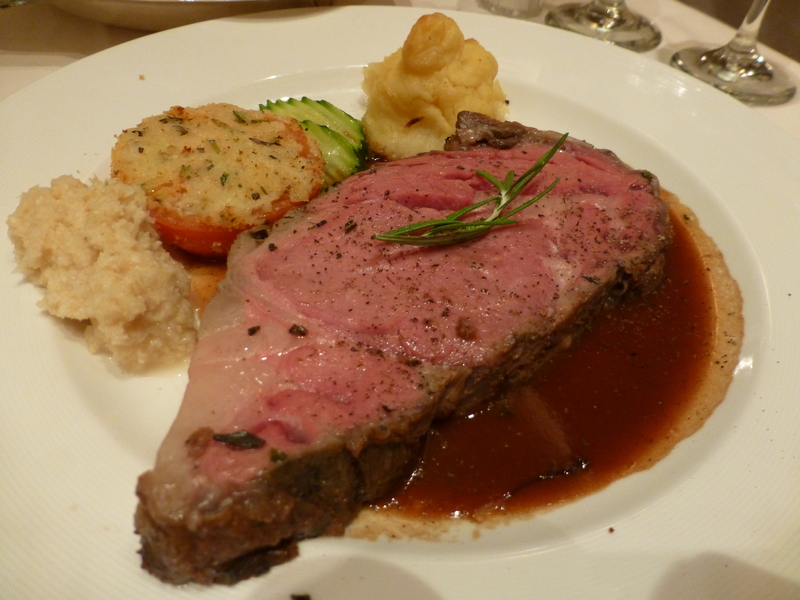 Similarly beef main courses (all cooked to order) were always spot on. Hot juicy and perfectly rested these never failed to please. 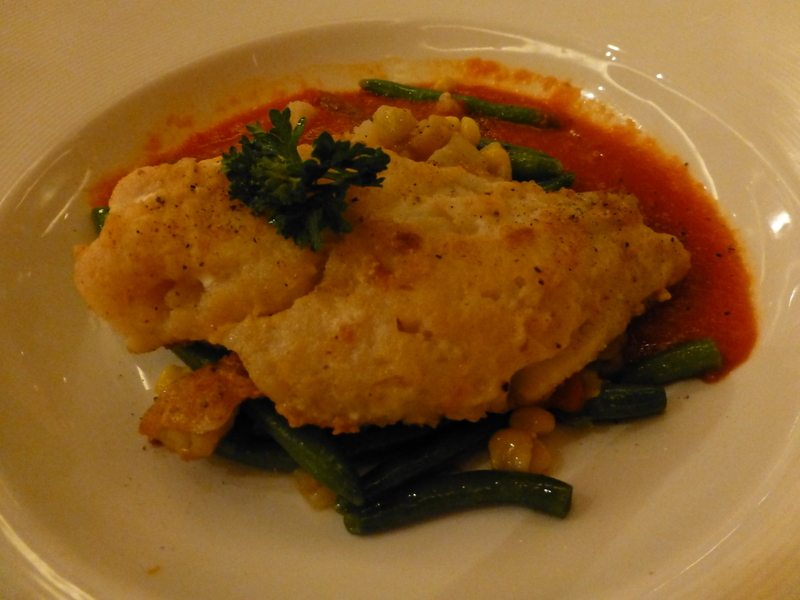 Unfortunately all the main courses that weren’t beef tended to be both overcooked, cold and lacking in flavor. 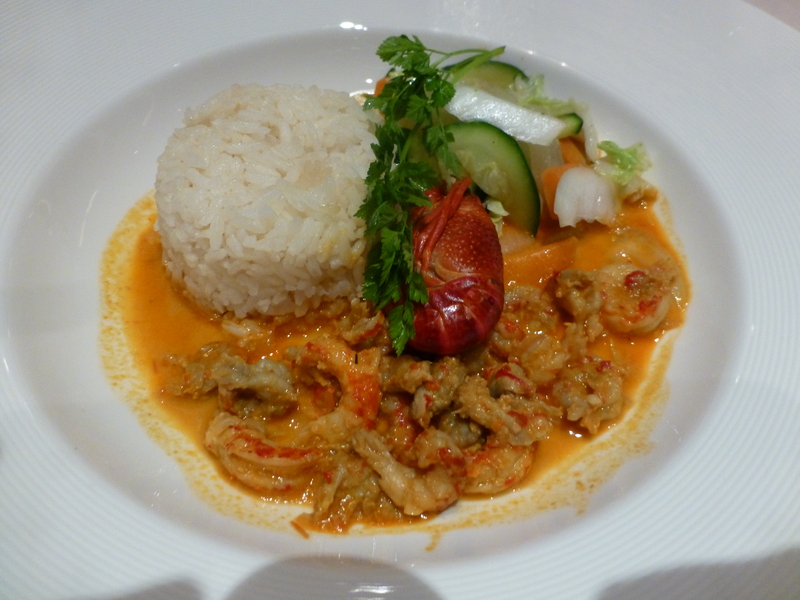 My biggest overall disappointment with the food was that it was not possible to try any sort of local cuisine. The choices available, while varied, were always quite traditional and US centered and while I accept that this is probably what most of their customers were after, it would have been nice to have at least one local dish as a possibility for the more adventurous diner. Another niggle was the service in the formal dining venues. Particularly that if one diner finished before the other their plates would be removed while the other was still eating. While I understand that the staff were very busy and under pressure this seemed very rude and intrusive and became a real annoyance. 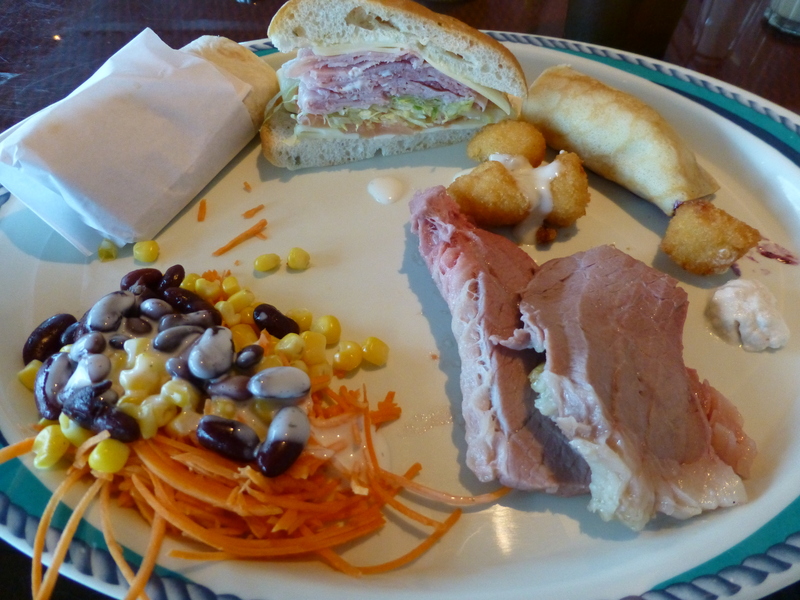 Despite some of the criticisms above I enjoyed a lot of the food on this cruise (how could you not enjoy free ice cream all day!). I think that if I had had longer on the ship I would have been able to make better choices as it took a few days to figure out what was good and what wasn’t. For example, it wasn’t until our last full day that we finally tried out the 24hour café which, it turned out, served really tasty salads and scrumptious little desserts that I really wish I had discovered sooner! They also cooked fresh egg and bacon muffins in the morning, something I would have indulged in every morning had I known! In the last week I’ve been lucky enough to visit two very different wine events. The first was the Salon des Vins in Thoiry, where 48 different, and largely independent, producers from all over France were exhibiting. Entrance and tasting was free, you just needed to pay the small sum of €4 for a glass (which you get to keep) with which to taste the wines. With so many producers to choose from it was hard to know where to start. There were a few regions and specialties that I wanted to try out and also I was with people who had been before and they were able to introduce me to some of their favorites. Obviously I couldn’t sample every stall, but there was so many different wines to try at each that despite being there for about 4 hours, I actually only made it to about 10 stalls in the end. However I definitely got my €4’s worth of use out of my glass. Fairs like this are a great way to find some different wines form producers that you are unlikely to come across in the shops. I was on my bike and so as a result I was a little limited in how much I can by (it was an interesting ride home! 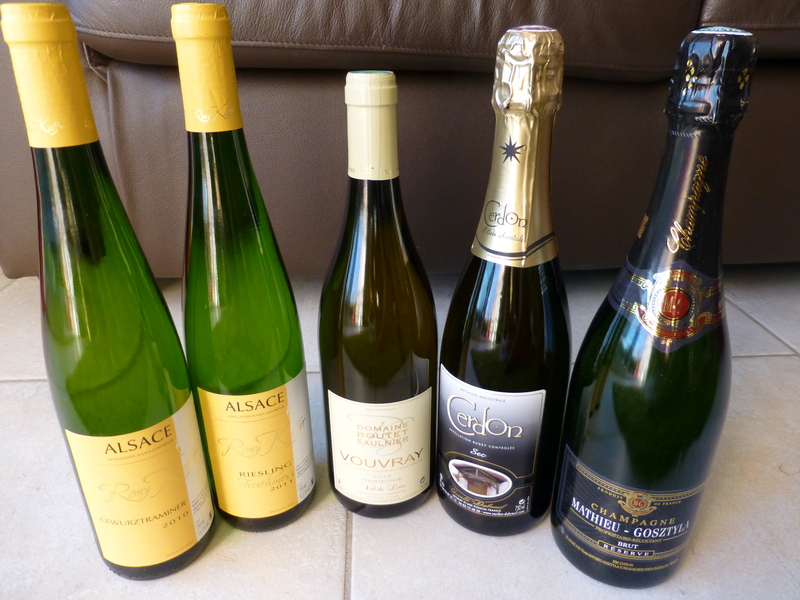 ), but in the end I got 5 really special bottles including two very unusual Alsace wines (a lemony Riesling and a rose scented Gewurztraminer) and a delicious sparkling pink Cerdon. 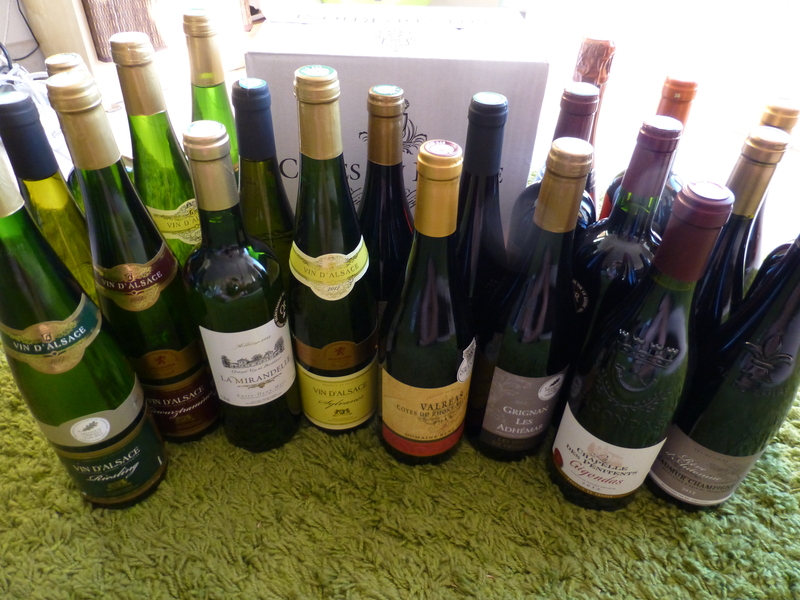 The other wine fair I visited was a very different affair – it was Lidl’s Foire aux Vins! Here you don’t get to sample the delights (which is a shame J) but you do get a huge variety of wines to choose from at great prices. A lot of the wines are award winning as well! This time the catalogue was 40 pages long and covered most of the major wine regions of France. Unfortunately in my store they didn’t have quite every wine from the catalogue that I’d had my eye on, but they still had a pretty good selection. While Lidl’s normal selection is a little more hit and miss, I have never had a bad wine from their previous Foire aux Vins. So with many gold medal winning wine available for less than €3.50, and having a car rather than a bike to get my goodies home, I went a bit mad and bought 28 bottles. I don’t think I’ll need to go wine shopping again for a while now! I’ve not just been buying wine this last week; I’ve also been doing some cooking! The two dishes that I wanted to share this week both involved showcasing one really good ingredient as the center of the dish, in these cases tarragon and goats cheese respectively. 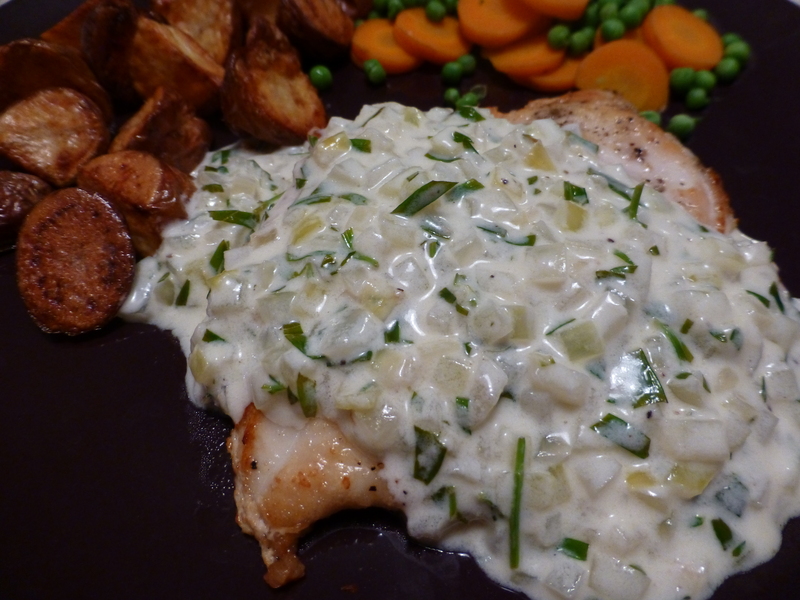 To start the week I made a wonderful dish of sautéed chicken with a creamy tarragon sauce. I’m a big fan of tarragon and am always looking to include it in dishes so to make it the star of the show was a real treat. This dish is quick to make as well as being tasty which makes it a lovely meal to whip up on a work night when you don’t want to spend too long at the stove. Despite the creamy sauce this is actually quite light and works for these last hot days of summer. The other big dish I made this week was the French classic salade aux chèvre chaud. Another quick supper this was a great way to use up more of my spicy salad leaves which have been growing profusely over the last week. 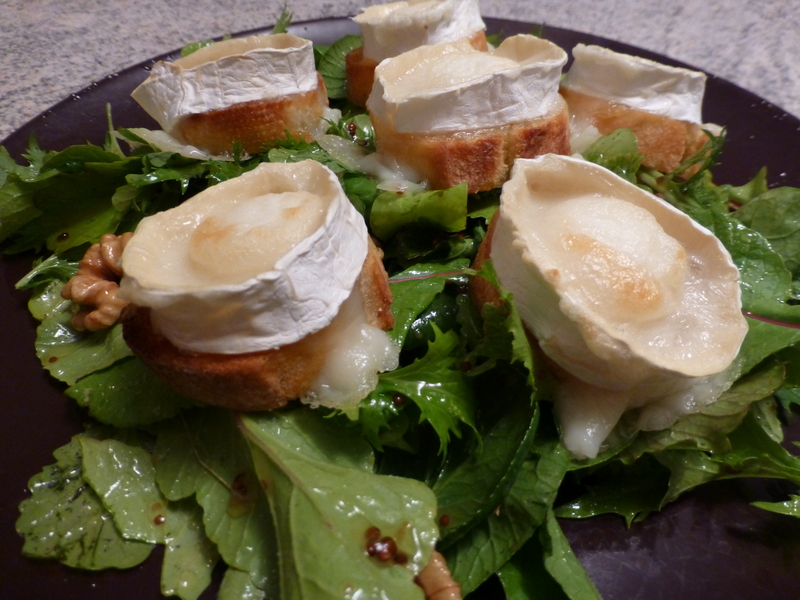 I love the contrasts of this dish; the unctuous melted goats cheese and the crisp baguette, the tang of the cheese itself and the sweet pepperiness of the dress leaves – you can see why it’s so popular.